Touch Done to get back to the main Event screen. 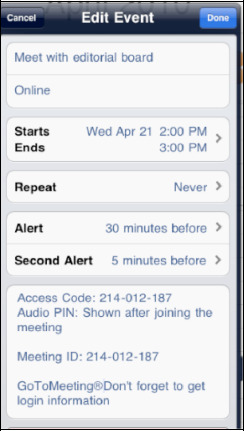 An audible reminder of an upcoming appointment – an alert – can help keep you from forgetting an important event. Follow these steps to create an alert. 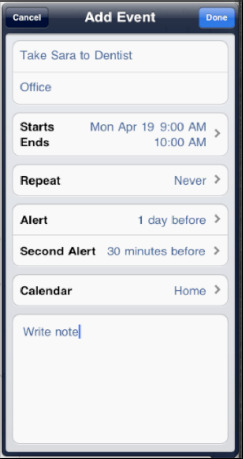 Touch the Alert tab and then select the option for a reminder alarm. You can have no alarm at all or set a time anytime from five minutes before the event all the way to two days before – whatever works best for you. 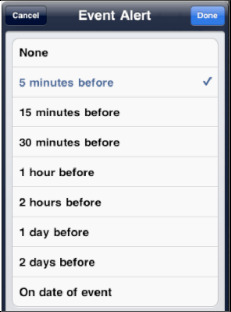 After you add an alert, you are given the option to add a second (optional) alert. This can be really useful if you need a second reminder to ensure you do not miss the event. For example, if you need to pick up your kids at the bus stop, you might want one alert 15 minutes ahead of time, then a final alert 5 minutes ahead of time, so you can be absolutely certain that you don't miss the pickup. Another good example of two alerts occurs when you have to take your child out of school for a doctor or dentist appointment. Set the first alert for the night before to write a note to the school and give it to your child. Set the second alert for 45 minutes prior to the time, so you can leave enough time to pick up your child and get her to the appointment. If you use more than one calendar in Outlook, Entourage, iCal or some other program and you sync your iPad with that program, you will have various calendars available to you. Touch the Calendar button in the upper left corner to see all your calendars. Tap the calendar you want to use for this particular event. 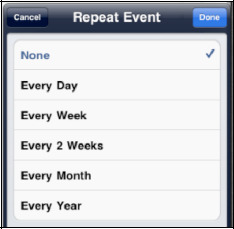 Usually, the calendar selected is the last one you selected for the previous event you scheduled on your iPad. 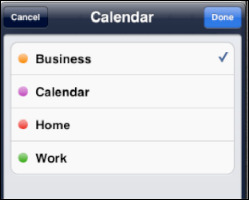 You will notice that when you edit the calendar event on your iPad, you will not have the option to switch calendars. If you wish to change the scheduled calendar on your iPad, you will need to delete the original event and schedule a new event on the preferred calendar. 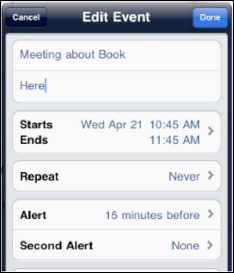 To delete the calendar event, tap the event, and then select the Edit button. Swipe to the bottom of the Edit screen and select Delete Event. Next, you will need to confirm that you want to delete the event. If you want to add some notes to this calendar event, tap Notes and type a few notes. If this is a meeting somewhere new, you could type or copy/paste some driving directions.